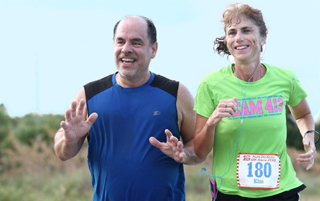 Both the 15K and 5K courses start at North Beach and are pure out-and-back 9.3 mile and 3.1 mile tours of Ft. De Soto Park run on paved trails and access roads. You will NOT be running on the sand. These are extremely flat and fast courses with no bridges, overpasses, or discernible inclines. They are accurately measured and will be certified by the USATF. We require that runners and walkers be properly prepared and trained to finish the 15K within 3 hours (18 minute/mile pace). Please note that 3 hours after the start, course support (i.e. aid/water stations, volunteers, course marshals, clocks, etc.) is not guaranteed. Our area’s weather in early October: average low is 62, average high is 82. Of course, the mild temperatures will be welcome while relaxing on our nation’s #1 Beach after the race.